This flowery utility box was found in the Annex neighbourhood near the one I showed you last week with the monarch butterflies on it. It is so cheerful and bright and will be a real treat to see in the dull winter months. The artist for this one is Muisca. ...and this garden needs no water! The two boxes are really neat and very crispy colorful. I adore it! That, and the lilies, our flowers are filled with friends, too! You are so right about the winter months. This one will stand out for sure! Very pretty! Just as pretty as the one from last week, certainly a cheerful sight for winter. It is bright and bold. What a great looking painting on that utility box. It now add to the neighborhood. Very colorful and pretty paintings. It will look cheery in the winter. Happy Monday, enjoy your day and week ahead! They certainly brighten up a dreary day! They're great to see, thanks. Very colourful and creative. The colours will look incredible when the dull months of winter arrive. Nice and bright. Love it! I think this is the brightest I've seen. It's very nice! 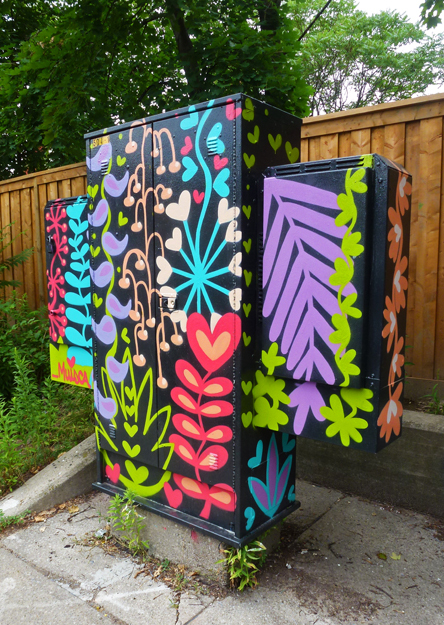 Every utility box should be painted!! I like the idea of decorating utility boxes. This is a good one.